How sick does this make you? In 1941, Monsanto began focusing on plastics and synthetic polystyrene, which is still widely used in food packaging and ranked 5th in the EPA’s 1980s listing of chemicals whose production generates the most total hazardous waste. This genetically modified hormone was developed by Monsanto to be injected into dairy cows to produce more milk. Cows subjected to rBGH suffer excruciating pain due to swollen udders and mastitis, and the pus from the resulting infection enters the milk supply requiring the use of additional antibiotics. rBGH milk has been linked to breast cancer, colon cancer, and prostate cancer in humans. 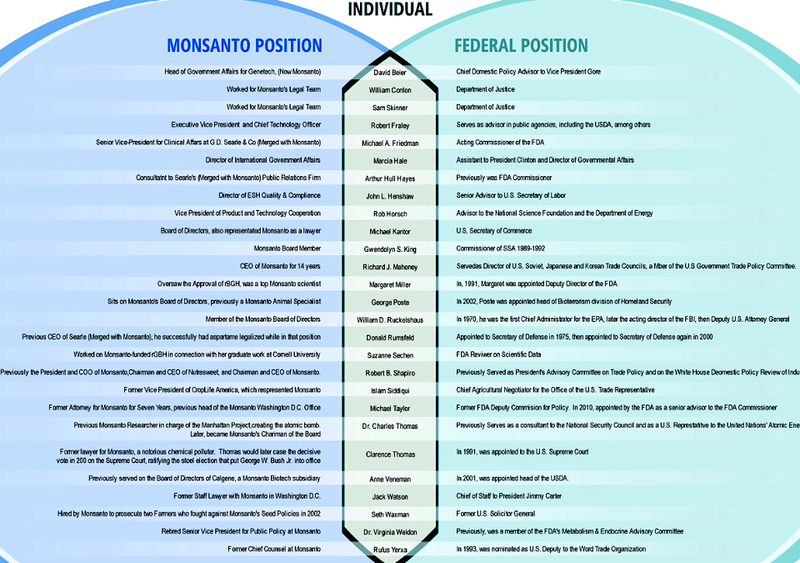 Fooling the FDA required a slightly different approach: click on the below chart to see how many former Monsanto VPs and legal counsel are now holding positions with the FDA. And don’t forget Clarence Thomas, former Monsanto attorney who is now a Supreme Court Justice, ruling in favor of Monsanto in every case brought before him. Between 75% to 80% of the processed food you consume every day has GMOs inside, and residues of Monsanto’s RoundUp pesticide outside. But it’s not just processed food—fresh fruit and vegetables are next: genetically engineered sweet corn is already being sold at your local grocer, with apples and a host of other “natural” produce currently in field trials. P.S. Monsanto’s not alone. Other companies in the “Big Six” include Pioneer Hi-Bred International (a subsidiary of DuPont), Syngenta AG, Dow Agrosciences (a subsidiary of Dow Chemical, BASF (which is primarily a chemical company that is rapidly expanding their biotechnology division, and Bayer Cropscience (a subsidiary of Bayer). View a complete list of companies doing genetic engineering on this website.